“Now to him who is able to do far more abundantly than all that we ask or think, according to the power at work within us, to him be the glory in the church and in Christ Jesus throughout all generations, forever and ever. Amen” (Ephesians:3:20-21). Rejoice with us as we welcome four people to the Kingdom of God! Pastor Lenin and his church shared the gospel with these four individuals, and now they have accepted the greatest gift of all. Pray with us for Mariano Rodriguez and Natividad de Jesus (pictured above). They will receive the second house funded by the special Christmas Roast of HOPE Coffee we sold called Build a Home for Christmas. May the building of this temporary shelter lead them to seek refuge in the eternal Shelter found in Jesus Christ! Pray with us for the town of Yorito Yoro, a town that recently received electricity. Pastor Pablo and his church bought light bulbs to install in the local church building. They will host Bible studies during the evenings as they encourage the community to join them in the church building to discover the Light of the World. 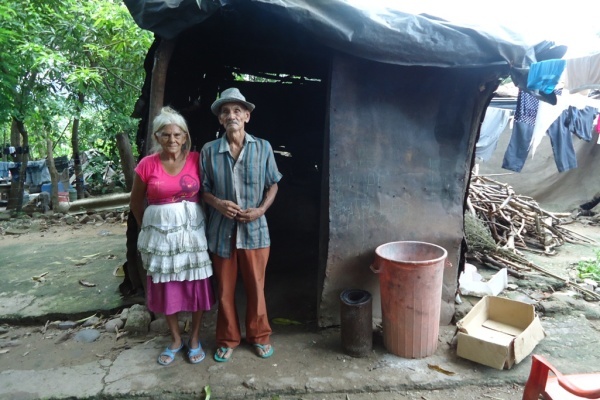 Pastor Pablo and members of his church – through funds provided by HOPE Coffee – are also serving a widow and her family by building her a bathroom and water system.